Kansas City native Evan S. Connell died Thursday at the age of 88. His fiction and non-fiction works were wide-ranging, but he was probably best known locally for his two novels, "Mrs. Bridge" and "Mr. Bridge," about a fictional well-to-do Kansas City family. 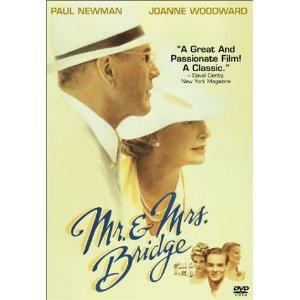 In 1989, the Merchant Ivory film, "Mr. & Mrs. Bridge" was shot on location here. Former New Letters on the Air host Rebekah Presson Mosby talked to the author on the set. Connell told her the characters in the books were familiar. The shorter version of this archived interview aired on All Things Considered. The longer version of this interview aired on KC Currents. (NOTE: This interview is an edited excerpt of the New Letters on the Air interview, which first aired in 1991). On how Connell's parents resembled Mr. and Mrs. Bridge: "The character of Mr. Bridge was founded more on the temperament and mind of my father than on any other individual. The Mrs. Bridge character to a lesser degree on my mother...and some things are simply fabrications." On how he realized the character of Mrs. Bridge: "Recollection, I suppose, more than anything else. And an attempt to empathize with the way a woman would feel at that time and place and under those circumstances. Everything had always been provided for her, and she was quite conscious of this and felt that she should somehow be contributing more to help other people some way, but she didn't quite know how to go about it." On deciding to write a novel about Mr. Bridge, 10 years later after Mrs. Bridge: "A number of years went by and I found myself continuing to think about the story from his point of view. And I was on a long trip around the world...one day, I realized I did want to do it, and I started taking notes immediately, piling up odds and ends, scraps of paper and stuffing them in the suitcase. At that point, I really became anxious to finish traveling, settle down into the usual dreary routine where I could work from 9 - 5 so to speak, and get to work on it." On returning to characters and knowing when to move on: "Probably the feeling that maybe if I try it again, I can do it better... the feeling that I haven't fully exhausted that subject or that technique. You never get it right, so you keep going back. And finally you move on to another subject I think as much out of frustration as satisfaction. The feeling that, well, I can't do any better than this, so, for better or worse, let's move on." New Letters on the Air, public radio's longest-running literary program, is a half-hour program that is produced by New Letters magazine at the University of Missouri-Kansas City.